In February 2012, Witt allegedly traveled to Iran to attend an all-expenses-paid "Hollywoodism" conference held by the Iranian New Horizon Organization, which DoJ describes as focused on promoting anti-U.S. propaganda, and then in 2013, she finally defected to Iran. Once settled in Iran, Witt worked actively for the Iranian government, who provided her with a housing and computer equipment, and disclosed the code name and classified mission of a U.S. "Special Access Program" and its specific target. 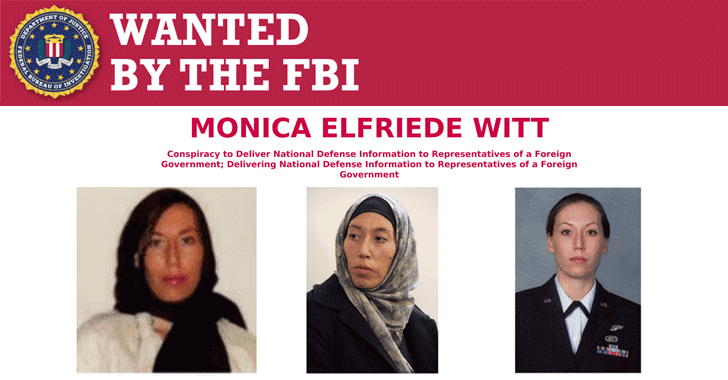 As part of her work, Witt conducted research about the U.S. Intelligence Community (USIC) agents she had known and previously worked with and drafted "target packages" that provided agents profiles for four Iranian hackers, who were also charged by the DoJ. Witt even shared the name of her former fellow U.S. agent, who is still one active, endangering the agent's life. The Iranian hackers then allegedly used that profile information to send phishing emails and social media messages to Witt's former colleagues with malicious links in an attempt to trick US agents into installing malware, which allowed the hackers to spy on their computer activities, webcam, and keystrokes. "In one such instance, the Cyber Conspirators created a Facebook account that purported to belong to a USIC employee and former colleague of Witt, and which utilized legitimate information and photos from the USIC employee's actual Facebook account," the indictment states. "This particular fake account caused several of Witt's former colleagues to accept 'friend' requests." Mesri is the same Iranian hacker who was charged by the DoJ last year in connection with cyber attacks against HBO and with leaking "Game of Thrones" episodes in 2017. The authorities said Mesri compromised multiple user accounts belonging to HBO to "repeatedly gain unauthorized access to the company's computer servers and steal valuable stolen data including confidential and proprietary information, financial documents, and employee contact information." "This case underscores the dangers to our intelligence professionals and the lengths our adversaries will go to identify them, expose them, target them, and, in a few rare cases, ultimately turn them against the nation they swore to protect," Assistant Attorney General John Demers said in a statement. "When our intelligence professionals are targeted or betrayed, the National Security Division will relentlessly pursue justice against the wrong-doers."